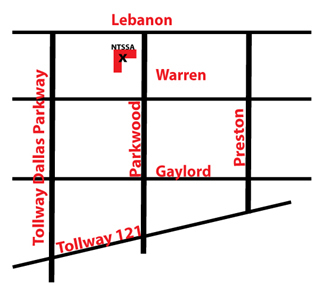 The office is located on the west side of Parkwood Blvd, north of Warren and south of Lebanon. after crossing Tollway - 121, exit Warren. Turn right (east) on Warren. Turn left (north) on Parkwood. Office will be on left (west) side of Parkwood. If you are travelling south on the Tollway-Dallas Parkway exit Lebanon. Turn left (east) on Lebanon. If you are traveling north on Tollway-121, exit Parkwood. Turn left (north) on Parkwood. Cross over Gaylord and Warren. Office will be on the left (west) side of Parkwood. If you are travelling south on Tollway 121 exit Parkwood. Turn right (north) on Parkwood. All entry to the office is through the front which faces south looking into the parking lot (except for deliveries).